Editor: From 2001 - 2009 Ethel Bignell rsm (ANZ) was MIA Administrator. In this article she shares her thoughtful and rich reflections on the Mercy questions that came to the fore in those years. As the MIA Members and Board met to reflect together on the call of Mercy today, there was a great awareness that Mercy is a theme that has been constantly proclaimed by Pope Francis and one to which the world seems to be responding with enthusiasm. It was thought fitting, therefore, to spend some time together reflecting on how the Pope’s message of Mercy-ing finds resonance in the lives of Mercy people. Maura Hyland, Board Director, spoke on the symbolism that is reflected in Pope Francis’ behaviours and actions. Mary Reynolds rsm, Executive Director MIA, spoke on the connection between Pope Francis' Vision of Mercy and the MIA Vision. Sr Mary's presentation and accompanying powerpoint are linked to this item. We pray for all who are entrusted with leadership in MIA at this time: for the Members, Board, Team, Staff and those who give expert support and advice. May we be faithful in upholding the vision, loving in our leadership, strategic in our thinking and courageous in our doing - worthy successors to those whose merciful service preceded ours and models for those whose service will succeed ours. MIA has been blessed with extraordinary Leadership from its foundation in 1992. In that time forty six Sisters have served as Members and forty Sisters, women and men have served as Board Directors. In addition, seventeen people have served on the MIC Board of Management. Editor: Young Social Innovators (YSI) is Ireland's largest social awareness and active citizenship and education programme for 15-18 year old teens. Its main goal is to get young people (15-18 yrs) involved in action which helps improve the lives of others in their community. YSI involves thousands of young people in Ireland each year in hundreds of projects and social enterprises which are youth-led, team-based and action-focused. At St. Mary's Secondary School, Mallow Co. Cork, an all girls voluntary secondary school with over 600 students, under the trusteeship of CEIST, the YSI students chose to raise public awareness of human trafficking as their project, engaging in a number of activities designed to bring attention to this significant social issue, working with Mary Ryan rsm (The Congregation) and Sr Catherine, members of APT (Act to Prevent Trafficking) . Students from McAuley School of Nursing, which is part of University of Detroit Mercy (UDM), recently participated in a Foreign Site Learning Experience in Ireland, including visits to Mercy International Centre, the Mater Hospital in Dublin, Mercy University Hospital Cork and the Convent of Mercy in Trim, Co Meath. A report on the visit is linked to this item. 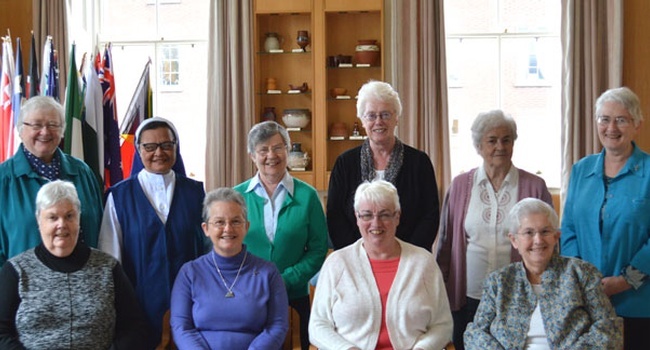 Editor: As well as offering a number of programmes of general interest to the Mercy world, MIC can tailor programmes to fit the particular needs of individual Mercy ministries/groups. To find out what MIA can offer your Mercy ministry/group, please contact Mary Kay Dobrovolny rsm - Assistant Director Heritage & Spirituality. Memorial Day, celebrated every year on the last Monday of May, is a federal (national) holiday in the United States for remembering the men and women who died while serving in the country's armed forces. For Mercy Associates in Fort Scott, southeast Kansas, Memorial Day is an opportunity to remember their deceased Sisters of Mercy. The Associates hold a prayer service and place crosses of flowers on the graves of the 79 Sisters who served their community, commencing in 1866, and who are buried in St Mary's Cemetery. A report is linked to this item. Linked to Fort Scott Tribune article with the publisher's permission. Editor: At Anderson Mercy Hospital Cincinnatti, the administration and staff work to ' understand the value of exceeding our patients’ and their families’ needs by including them in the healing process. ... to foster an atmosphere of a patient-family centered care environment.' One way in which they are working to achieve that is by involving 8th graders from Nagel Middle School in an important design project - the family lounge to accompany the new intensive care unit. For the sixth year in a row, OLMC Parramatta, NSW hosted the youth social justice conference Kids View, welcoming over 40 students from a number of Sydney schools on Wednesday, 21 May 2014. The annual student conference aims to inspire young people to take action by exploring complex global issues such as poverty, homelessness, hunger, child labour and exploitation and consider solutions. Students heard the experiences of volunteers who have worked with street children in the Philippines and then joined in Millennium Development Goals workshops led by passionate young people exploring issues surrounding health, work, education and food in developing countries. Eucharist was celebrated in All Hallows Chapel by Frs Rod and John MacGinley, brothers of Diamond Jubilarian Joan MacGinley rsm. The quotations in The Little Book, compiled by Don Mullan, provide a profound insight into the thinking and spirituality of this remarkable woman, thus offering the reader food for thought and substance for prayerful reflection. Introduction by Ethel Bignell rsm (ANZ). This new computer simulation of the universe spans more than 13.8 billion years. A result of more than 100,000 lines of programming code, the video says the model was "executed on the fastest supercomputers on the planet," in the United States, Germany and France. Mercy University Hospital was established by the Mercy Order in 1857 as a 40-bed hospital staffed by four Sisters. However, in the intervening years it has expanded rapidly both in terms of facilities and accommodation, becoming the second largest hospital in Cork. No event of particular significance is recorded in the Mercy Through the Years Calendar as having taken place on 28 May. We know, however, that the Works of Mercy continued to be carried out and so we remember on this day Catherine and all our Sisters, Associates and Co-workers who have given their lives in service to others. in the eyes of the stranger and the needy. Slavery, human trafficking, and forced labour are more profitable than oil or finance according to a recently released UN Report: 'Profits and Poverty: The Economics of Forced Labour'. 'Francis - Pope From The New World.' An accessible video portrait of 'the first Pope from the Americas, the first Jesuit [pope], and the first [pope] to take the name Francis'. Watch it here (51:17). Suitable for second level students as well as individual or group viewing. Note: there are ads. Smh.tv explains it this way: 'smh.tv is free because we serve advertising and we only serve at most two ads per break'.